Dear readers, I’m not going to lie to you. This sandwich was a bit messy to eat. But it’s super delicious, and possibly my favorite grilled cheese experiment yet. The sweetness of (Yankee) cornbread plays off the spicy cheddar cheese and smoky poblano pepper. A squeeze of lime adds a much-needed splash of acid, and the avocado doubles the creaminess of a regular grilled cheese. If the time were right, you could throw a tomato in there, and I’m sure that would be tasty too. You could certainly make this grilled cheese on regular bread. It would hold together better, and you’d get to pay more attention to the tasty filling. But it’s kind of fun to experiment, right? And cornbread is delicious. It just crumbles a little, which is why I recommend a no-flip method. 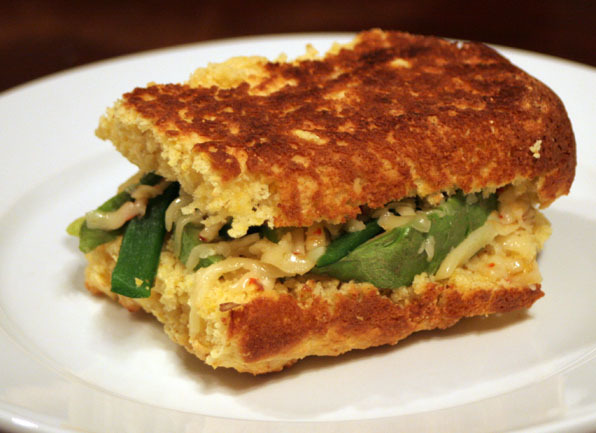 After cooking the sandwich on low in an ovensafe pan, slide it into the broiler to melt the cheese and crisp up the top. Flipping this beast might be a disaster. Another option would be to make this as an open-faced sandwich, in case you don’t really want to eat gobs of cornbread. Not that there’s anything wrong with that. I’m including my mother’s recipe for cornbread here. It has a much nicer texture than store-bought, and really is a snap to whip together. Stir it up, pop in the oven, and have a beer while it cooks. By the time you’ve prepped the sandwich ingredients, it’s ready to go. Leftovers are delicious with Lab Party Six-Way Chili, a recipe you should totally try. Or top with fresh fruit and ice cream or whipped cream for dessert. I encourage you to find pepper-cheddar as opposed to pepper-jack, the more robust cheese flavor is great here. Let cornbread cool ten minutes if you’ve just baked it before removing your sandwich-sized piece. Carefully split bread in half lengthwise and set aside. 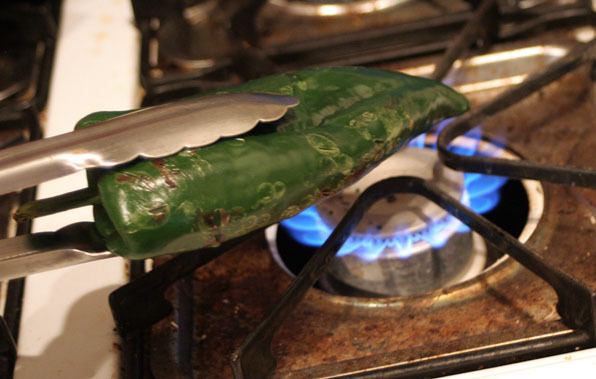 Hold poblano pepper over the open flame of your gas stovetop with metal tongs, turning until blistered on all sides. Let cool. (If you don’t have a gas cooktop, you could broil the pepper for a few minutes, turning once, or just leave the pepper raw.) Slice into thin strips. You will only need about 1/3 of a pepper per sandwich. Have grated cheese ready. Squeeze lime over avocado and sliced peppers. Warm an ovensafe heavy skillet. Add bottom layer of cornbread, then sprinkle with half of the cheese. Arrange pepper and avocado slices on top, then top with more cheese and the top layer of the cornbread. Cover and cook on low six minutes while you preheat broiler. Slide pan under broiler and cook about two minutes until cheese is melted. Avoid burning top layer of bread. Serve with additional lime wedges and good beer. Thanks, Josh! And welcome to the site! There are non-grilled-cheese recipes if you look in the archives! Okay, we are mid-discussion on Twitter and you throw this curve ball my way! Avocado and cornbread—my oh my—is it possible to fall for a grilled cheese? I’m thinking it just may be…Thanks lady…now back to Twitter. I love this idea! I make cornbread fairly often but I’ve never thought about a grilled cheese. Thanks for posting this great recipe! I love your blog and will definitely be back ot browse the archives. Excellent, excellent idea! I need to stop reading your blog now because I’m starving. Ok, fixed how. Somehow deleted flour. Should stop posting late at night. All correct now. You’re killing me–all of your grilled-cheese creations are amazing! I want every single one of them, and will do. I’ve been craving grilled cheese for… many days now… thanks to you! Never thought to use cornbread in this application before. And yet, it seems so right! Thanks for the inspiration. That looks delightful. Great idea using tongs to hold the pepper over the flame. I always manage to singe my hand when I try doing this. Wow, cornbread grilled cheese??!! You’re right, probably very messy, but probably very tasty!!!!!!!!!!!! Oh geez, yet another great grilled cheese recipe…I’m in trouble. Wow wow wow…..taking 3 of my absolute favorite foods, and making them into one delicious triumvirate of yumminess? I’m going to make this!! !